Have you ever stayed to close to someone you were leading rather than step back and let them lead? We all have done it at one point or another. Whether we didn’t have time to wait or we simply were not patient enough! The other day I was at chik-fil-a with my son. Like most 2-year-old boys do he just had to take some time to play in their play place. 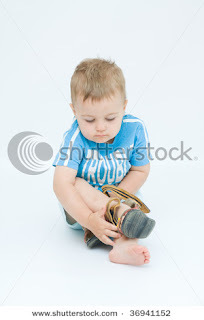 So he had to take his shoes off and of course with that comes putting them back on. I was running late and because I’m a sucker I let him talk me into staying a bit longer. So then I was really running late. Mason is one of the most independent kids I have ever seen. It really blows my mind how he has to do everything on his own. As we went to leave I grabbed him to put his shoes on for him and he wasn’t having it. He had to do it. It took 3 times as long and I had to talk him through every step if it. Something occurred to me as I walked out with him. He has to learn how to at some point and I can either be there for him to help him through and celebrate with him or I can do it for him until one day when I’m not there he does it! I can be a part of his wins or I can force him to figure it out on his own and not be a part of it. The choice is mine. Leaders you have to walk the next gen of leaders and learners through what they are doing. It may take longer and we don’t always have time for it, but in the end we are responsible for elevating the next group of leaders in our organization. In my personal humble opinion you can do all the amazing things in the world where you are, but if you don’t set your team up for success if and when you move on then you have failed. Lets be apart of celebrating their wins not force them to figure it out on their own. Let them watch you – This is as simple as it seems. Allow your teammate to watch what you are doing and then ask as many questions during and after as they need. Do it together – take the time to do it together and dialogue about how it went. This is talking them through the process on a deeper level. Watch them do it – This step often gets left out, but be sure that you ACTUALLY watch them do it and them coach them through what went well and what didn’t. Just like my son your leaders want to succeed. If you don’t clarify what success is they will figure that out on their own. Would you add to this list? If so what?